The new ŠKODA KODIAQ RS proves that roominess, practicality and a passion for sport can be a good mix. Learn more about the new powerful version of the KODIAQ, the popular SUV, in our photos and video from the Paris Motor Show. 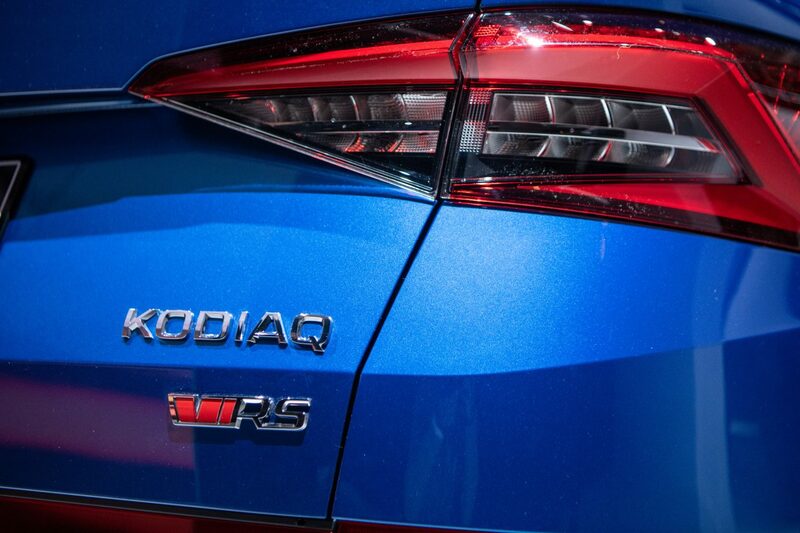 There’s no way you can miss the KODIAQ RS. 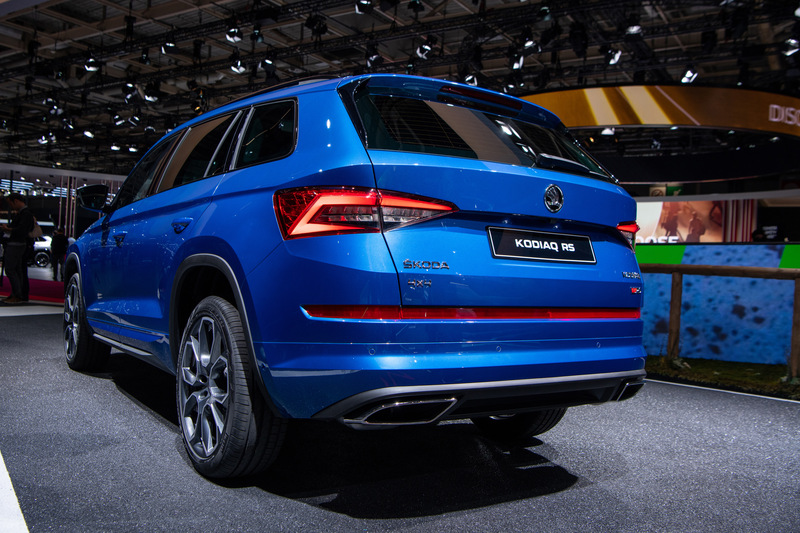 “You can see how sporty and masculine the new ŠKODA KODIAQ RS is as soon as you look at it. 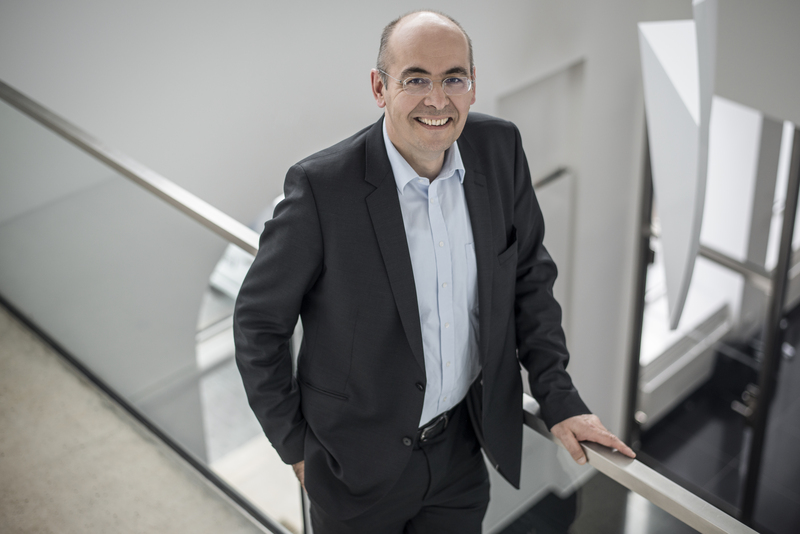 The very large bonnet has a pronounced bulge, which goes on to form a line encircling the entire car, with the ŠKODA logo taking pride of place in the centre of the broad fascia,” says Karl Neuhold, ŠKODA AUTO’s head of exterior design, speaking on behalf of the team of designers. The body-colour front and rear bumpers (the front bumper has a built-in spoiler, while the rear bumper incorporates a strip of retroreflector and pronounced tailpipes) and the high-contrast glossy black accents are also RS-specific. The KODIAQ’s high-output full-LED front and rear signature lighting illuminates the road ahead. The car hunkers down onv20” Xtreme Anthracite alloy wheels. 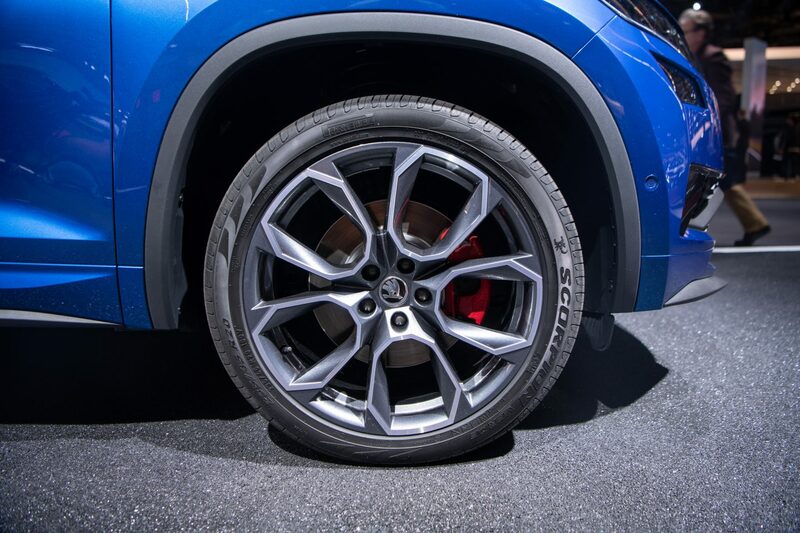 Sheltering behind them are seventeen-inch brakes.“The new ŠKODA KODIAQ RS’s 20” wheels have the distinctive appearance typical of RS models, underlining the robust look of the car as a whole. 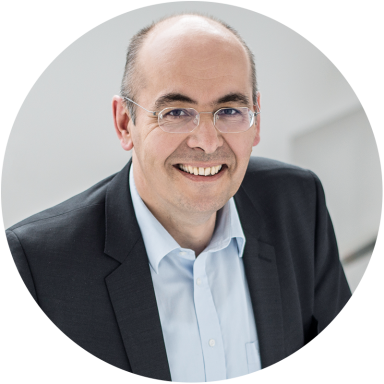 Their interesting design creates striking lighting effects,” says Neuhold. 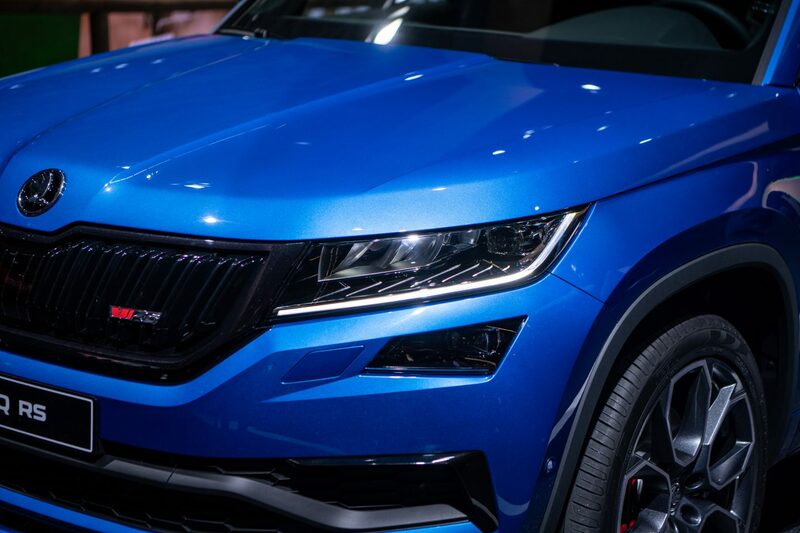 “The sublime shoulder line running along the side of the ŠKODA KODIAQ RS intimates just how dynamic the car is. The most sporty KODIAQ SUV boasts glossy black side-window trim and rear-view mirrors. The high-gloss black aluminium roof rails are another feature typical of RS models,” explains Neuhold the details of car exterior styling. 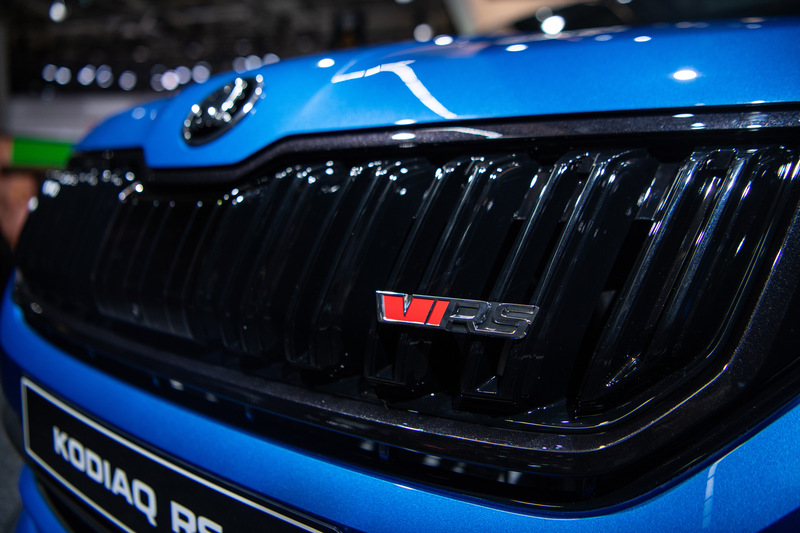 The fastest KODIAQ version also introduces a new RS logo in which the letter V (for victory) is red (having previously been a combination of black, green and red). You can find this badge both at the front (on the radiator grille) and at the back (on the fifth door). 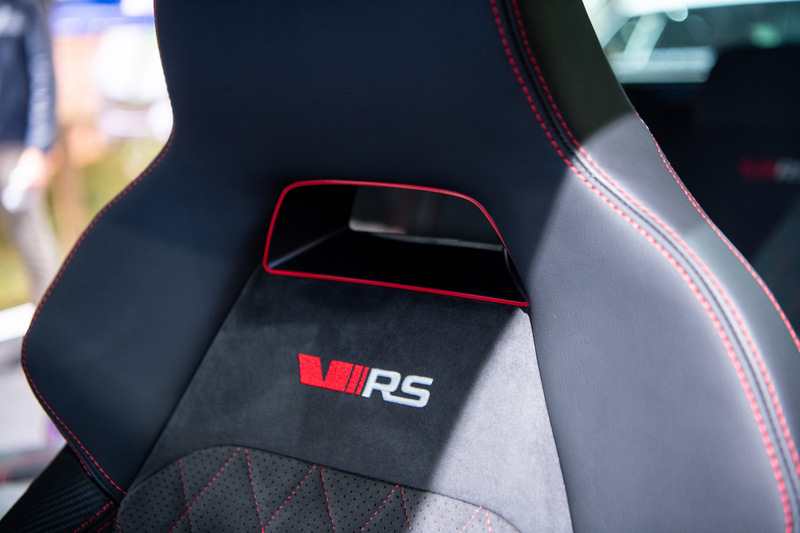 It goes without saying that the interior would not be complete without the RS logo either, so you’ll see it on the welcome screen of the infotainment system, at the bottom of the steering wheel, on the DSG automatic transmission’s gear selector knob, and embossed on the backrests of the sports seats. 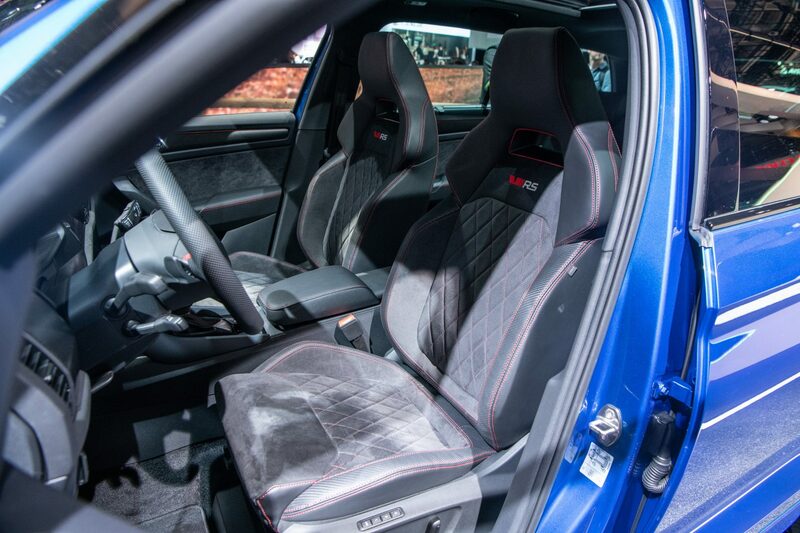 These seats boast sound lateral support and have been upholstered in Alcantara and leather by the interior designers, so they hug the body perfectly in quick turns and guarantee comfort on long journeys. For greater convenience, they are electrically operated, and the driver’s seat even has a memory function. 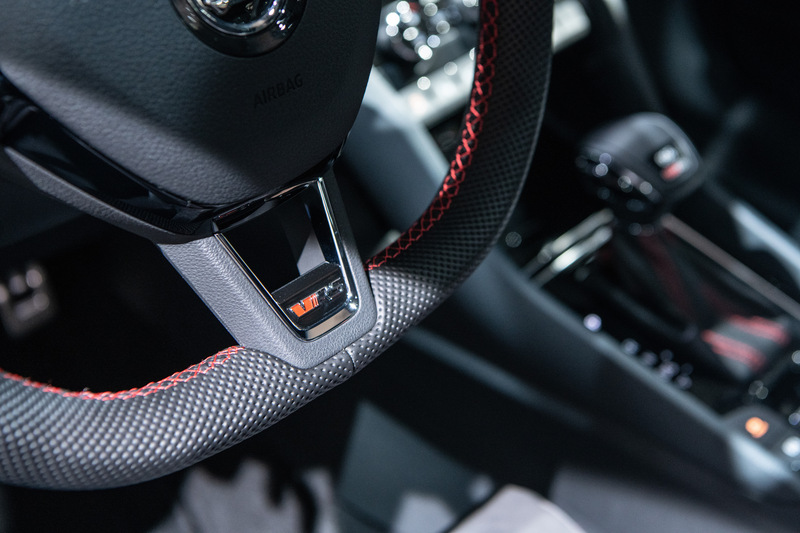 Drivers will also experience the joy of a perforated-leather sporty multifunction steering wheel with manual shift control of the DSG gearbox. 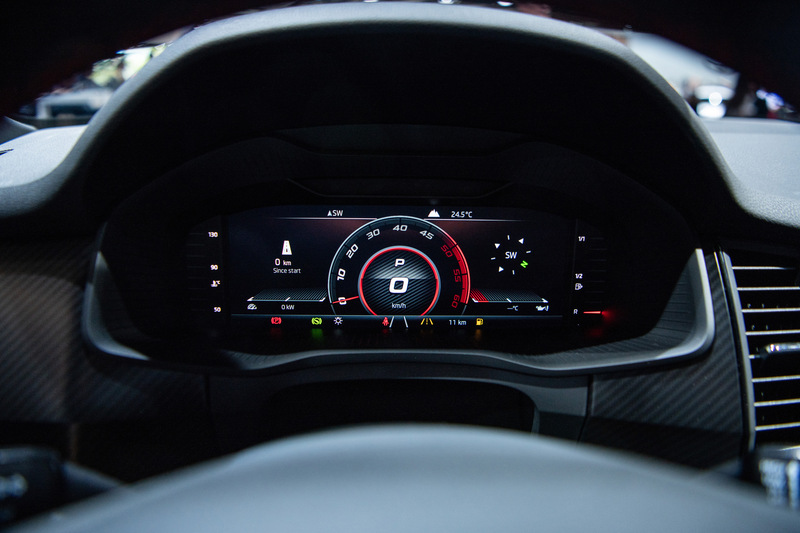 Instead of conventional analogue instruments, they will find themselves looking at a Virtual Cockpit with a carbon-look screen and five different display options – the sport display has a central tachometer, enabling drivers to concentrate on what is vital for a sporty ride. The satisfaction of spending time in the passenger compartment will be enhanced by the dark colour scheme (a black ceiling and pillars) and high-quality materials (Carbon decorative trim on the dashboard and in the doors, Alcantara door panels, and high-contrast red stitching on the steering wheel, seats, door armrests and front central armrests) complementing car’s interior design. The pleasant atmosphere will be rounded off by the variable 10-colour LED ambient lighting supplied as standard as part of the LED Package. 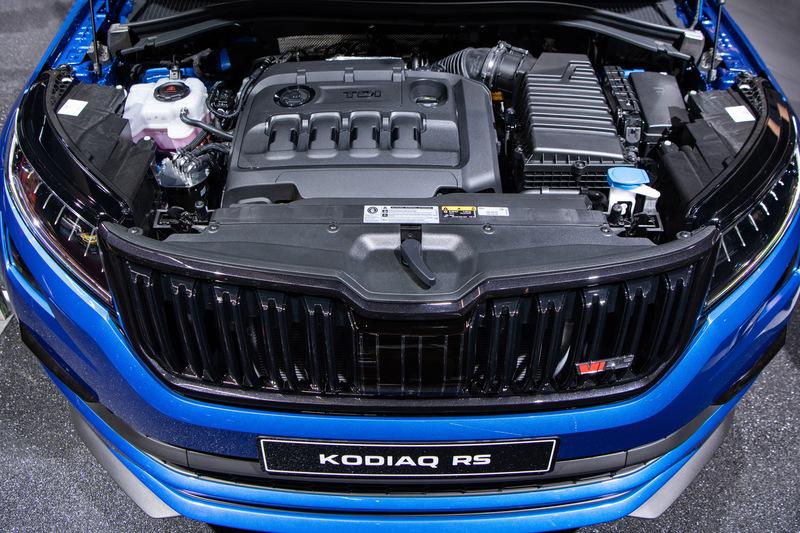 The heart of the KODIAQ RS is the new four-cylinder bi-turbo diesel 2.0 BiTDI, delivering power of 176 kW and torque of 500 Nm thanks to the twin sequential turbocharging. Power of this engine transforms large SUV KODIAQ into a real performance vehicle – it accelerates from zero to 100 km/h in 7.0 seconds and allows it to drive at speeds of up to 220 km/h. The engine sound is amplified by Dynamic Sound Boost, adding extra spice to this speed thrill. 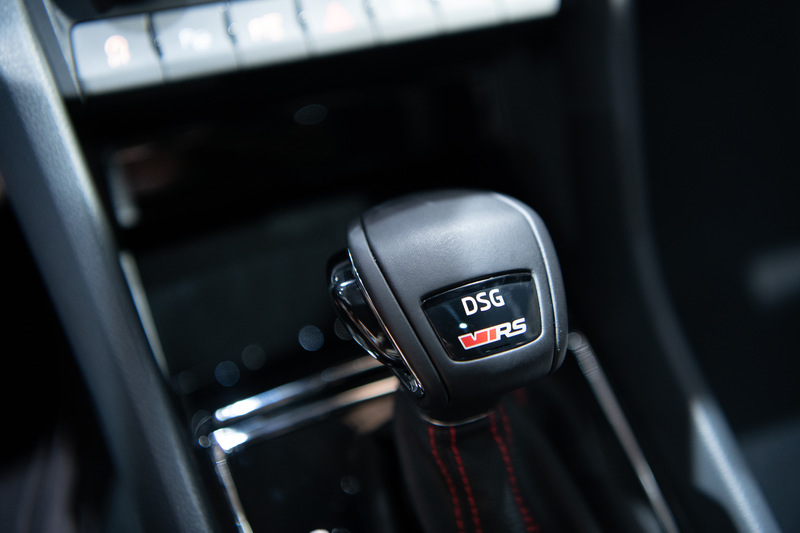 The 2.0 BiTDI engine is paired with a lightning-fast shifting DSG seven-speed automatic dual-clutch transmission, delivering power to all four wheels courtesy of the intelligent 4×4 drive, which works automatically and – drawing on driving data – continually adjusts the torque distribution between the axles and individual wheels. Four-wheel drive guarantees perfect traction whatever the situation – whether you need to speed off quickly, take a sharp corner, go off-road, or make your way through water or snow. The driving experience is enhanced even more by Driving Mode Select combined with the DCC Adaptive Chassis, which can transform the KODIAQ RS from a quiet family SUV into a pumped-up athlete. 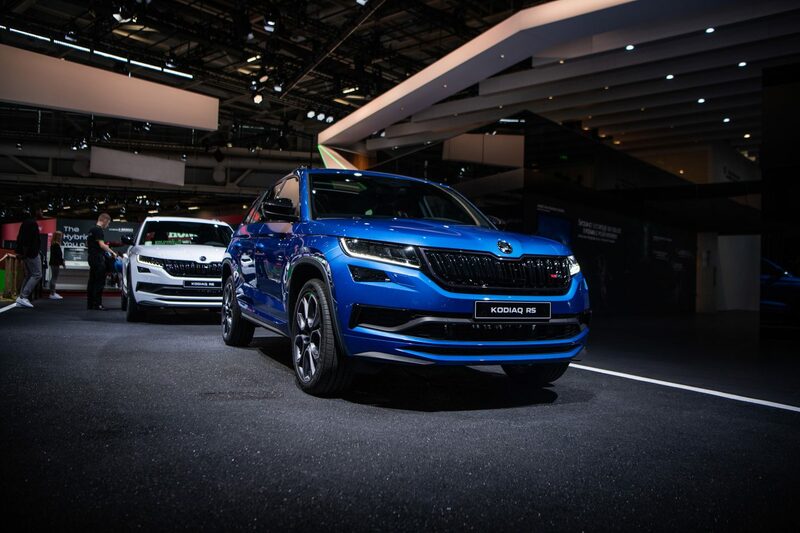 All these components created a perfect mix that enabled the KODIAQ RS, in the hands of the famous racing driver Sabine Schmitz to conquer the 20.8 km Nordschleife, the legendary Nürburgring’s northern loop, in just 9:29 minutes, setting a new record for a seven-seater SUV in the process.